This week I will be featuring four different products that are available to use for our monthlys. They are all reusable! Every women has their own preferences and I hope I can help you switch from disposable pads and tampons to be more green! And even better to SAVE MONEY! A great start to this event with one of my favorite products – Tree Hugger Cloth Pads – or Mama Cloth as it is also called. I featured Crystal, the wonderful mama who makes these pads, last September when I tried mama cloth for the very first time. It was a cloth diaper experience all over again. Why did I wait so long to try these out?!! Why do I think Tree Hugger is the best? Lots of reasons! ~ handmade. I love supporting wahms. ~ minky. Not only are they super soft but they do NOT stain. I have used each of my pads 2-3 times per cycle for a year now and they look as good as new. Promise! ~ cute. You know me, the cuter the better! Yes even my mama cloth is more fun cute! ~ comfortable. I’m more of a pad girl then tampons so one of the first things I ever noticed was how much more comfy it was to wear days worth of minky pads vs plastic disposables. ~ easy. Keep a wet bag next to my potty. In goes the pad when I’m finished with it. I can toss the bag in any load of laundry – diapers, towels, and yes even clothes. They come out wonderfully and so does the rest of your stuff. When you go out you may want a purse-sized wet bag which is also sold at Tree Hugger. See Crystal has thought of everything! Have I convinced you to try them? What else do you need to know? Ask me! WIN a few to try! Edited to add years later: Still use Tree Hugger every single month! 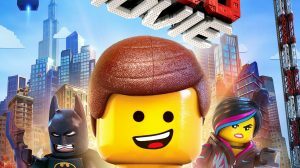 Movies on Demand Summer Giveaway! I liked treehugger on facebook! I am a fan of Tree Hugger Mama Cloth on Facebook and I would loooooove to try these! I love all the prints I see! 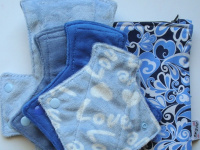 I have been using cloth pads for about 3 years and have a 3 TreeHugger pads and they are some of my favourites. The minky is sooo soft and really does not stain at all! I like Tree Hugger Mama Cloth on Facebook. i think mama cloth is a wonderful idea and i would love to try some! I am a beach bum. I love mama cloth. I prefer it to tampons and plastic pads any day! I would love to try some Mama cloth!! I have been looking into the options and liked Tree Hugger's pads the best! I like Tree hugger on facebook! Love mama cloth. I did a guest post regarding it about a month ago on Cloth Nappies are Fun. When I'm not using my diva cup, I reach for mama cloth. These ones sound really soft. I have bumbledoo ones. I'm a beach bum. Thanks. I've seen these types of products on other sites. Not sure if it was this company or not though. Also crocheted tampons. These are a great idea! I have been thinking about it but haven't ordered any. Chrystal has some pretty designs & I like the minkie cloths! I love her stuff, the non-staining feature is particularly appealing to me since stains bother me a lot! I like TreeHugger on Facebook too. I get Beach Bum mail:) lol! I've heard of these before but have never tried them! I'm hesitant to try them out, but what have I got to lose? If I win, I'll give them a shot! I've been getting your emails for quite some time now! I became a Fan of Tree Hugger on FB! I follow you on GFC as Jessica Sapalio. Thanks! I would love to try mama cloth! I've never used it, but I'm definitely interested. I have only heard good things about it! I have never used Mama cloth, but I've been wanting to try it out. Since, I started using cloth diapers on my daughter; I now hate how many pads and tampons I use/year. I like Tree Hugger's store. I like how she has many different fabric options for her mama pads. I like Tree Hugger on Facebook (Sarah Jane). Like Crunchy Beach Mama on Facebook (Sarah Jane). Signed up to get e-mails to my inbox. So I've never tried Mama Cloth but I am open to trying it! I have a small stash of Mama cloth, but I haven't taken the plunge yet. I need to build up my stash and wait until this pregnancy is over. I'm really worried about the washing part... It seems different than diapers? I like Tree Hugger MC on FB. You find the coolest shops. I love your blog!! Tree Hugger must be doing good business, she's sold out of a lot of products. She makes it easy to order it anyway though. Prices are good also. I like/follow Tree Hugger on Facebook as Ricky Todd. I love these! I mean I havent ever tried them but really want to. They look so comfortable and I love that you can throw them in the wash with everything else. This is a great giveaway! I love mama cloth! I'm upset that it took me so long to find out about it! I honestly never thought of having a nondisposable item of this type, but now I'm excited about it. I would love to try them. I like Tree Hugger Mama Cloth on FB. I love the color selection available in TreeHugger's store. I like Tree Hugger on facebook! Katy A.
I have spent the vast majority of my life with a weak bladder and the idea of these is one that I could definately get behind! I know that they would absorb better then MOST pads and who doesnt love the fact that they are reusable? All I see is the dollars I'd be saving! These look so much comfier and of course greener than disposable pads. I'm a little nervous about the "washing" aspect of mama cloth though! Guess I need to do more research! 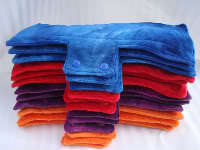 I like tree hugger on FB - Marianna B.
I love that mama cloth is environmentally conscious and better for me! Initially I thought 'ick', but as I've thought more about it I have been thinking I'd like to try a Diva cup and reusable liner option down the line when my cycles resume. I have some mama cloth that I bought last year...2 weeks before I found out I was pregnant :) I have a few pads and a few liners. LOVED using the liners for my, um, leaking during pregnancy. Can't wait to try out the pads when my cycle returns (but I'm definitely okay with it waiting a while longer!! :) I'd love to add to my stash! I have never tried mama cloth- I am kind of scared but would be willing to try if I win! maybe it would be a sign. I cloth diaper already- why not make the switch if it works? I am surprised that I am even thinking of Mama Cloth, but now that I cloth diaper, it doesn't seem so odd. I love her hand dyed pads! I want some of the thong liners too! I have never used reuseable menstrual pads, but I've always been interested in trying them out. I really like the cute designs that tree hugger mama clothes offer and I'm interested in saving money.Definitely liking that its a green product, always important to be environmentally friendly.Plus it be awesome to feel a little more comfortable during periods. Great giveaway! Following Be a BeachBum on GFC under Berendina and I liked your Facebook page under Berendina Dykema. Signed up for Crunchy Mail under my e-mail! I never even knew mama cloth existed until I entered the world of cloth diapers. Then a trusted friend told me she loved it, and I started reading articles about it. Now I'm super interested in trying it! I liked Tree Hugger Mama Cloth on FB! I'm Kathleen F.
I also liked Cruncy Beach Mama on FB! The store looks awesome! I have never even heard of this type of alternative! I liked Tree Hugger on Facebooks as Chellsea L. ! I follow Tree Hugger Mama Cloth on FB as Jeniffer Sheriff Smith. I follow you via GFC as Jeniffer Smith. I like the TreeHugger Mama Cloth on Facebook! :D Thank you!! Janine M. likes Crunchy Beach Mama on Facebook! Thanks! I'll be using mama cloth for the first time in a couple weeks for postpartum. I'm kinda nervous about it, but I think I'll like it! I want to try mama cloth and love her store since everything looks so soft!! I follow via GFC (Danielle Knapp) Thanks! I love mama cloth! It's so much more comfortable to wear. I haven't tried mama cloth yet however I would love to! I love the pretty colors she has! mama cloth is a fantastic way to go green! I'd love to try cloth. These look great. Thanks! I like TH on fb! I'd really like to try any of the products on Tree Hugger! I am very interested in making my monthly period more sustainable. I love mama cloth and would never go back to disposables! I like Tree Hugger on Facebook as Zootastic Zookeeper. These would certainly be a money saver! Feminine hygiene products are outrageously priced. I think this is a great idea. Would love to try them! Haven't moved in ti mama cloth, but I do have a diva cup and love it! I 'like' Tree Hugger on Facebook (Jill Dodsworth Payne). I 'like' you on Facebook (Jill Dodsworth Payne). Honestly, I AM a little iffy on cloth pads, but I'm certainly willing to give it a try, especially since my sister in law said it can help cramps! i just started using mamma cloth and love it! I really want to try Mama Cloth, but I'm not sure where to start and if I'll like it! I'm such a cloth diapering fanatic that it only makes sense though! I really like these because their not only good for the environment, but good on the wallet too. I Like Tree Hugger on Facebook. I'm not too sure about this, but it sounds interesting. I'd love to give it a try, as I'm open to just about anything. I like TreeHugger on Facebook. I have not tried Mama Cloth yet, but I want to! I think Tree Hugger's shop looks like a great place to start! I like Tree Hugger Mama Cloth on FB (Meliya H). I've been eyeing these for a while. I think they'd be interesting to try. I love that they have a variety of colors, etc. I definitely want to use mama cloth. I bought some WAHM mama cloth, and I do like them, but they're a bit bulky for my taste. Next time I'll have to buy from Tree Hugger! I actually look forward to my period thanks to cloth pads! Never thought I would be this excited to have aunt flow visit!!! I think Mama Cloth is a lot healthier for us ladies! I haven't tried mama cloth yet but am really curious about it. I would love to reduce the amount of waste I thrown away from feminine products, particularly pantyliners! facebook follower of CBM too! I receive Crunchy Mail to my inbox! Would love to try these! Thanks for the chance! mama cloth is great for the environment, i think that's how they did it in the old days! I currently use mama cloth, so I'd love to try these! I think mama cloth is an idea I'm ready to try!